The provincial authorities of Khanh Hoa, where there is the beautiful sea city of Nha Trang and Cam Ranh bay, believe that the local tourism still cannot develop well because of the lack of international air routes to the Cam Ranh airport. The airport has got more bustling since late 2011 with more flights from Russia’s Far East and South Korea’s Seoul. However, the airport’s performance heavily depends on the clients, because travel firms join forces with some international airlines to charter aircrafts to carry travelers to Khanh Hoa province. Meanwhile, there are not many official international air routes to the locality. Khanh Hoa, with the famous Nha Trang beach, is in no way less attractive to tourists than Da Nang City. Meanwhile, the Da Nang Airport has had four domestic and nine international air routes already which link the city with Hong Kong, Singapore, Japan, China and Taiwan. Most recently, the Hong Kong – Da Nang air route been opened by Dragonair which provides three flights a week. As for the Cam Ranh airport, the national flag air carrier Vietnam Airlines provides seven flights a day from Hanoi, HCM City and Da Nang to Khanh Hoa. VietJet Air has opened the air route from Hanoi and HCM City to Cam Ranh with the frequency of two flights a day. However, its flight schedules change seasonally. In high season, the passengers in the north and south complain that it’s very difficult to book air tickets to Nha Trang City. Travel firms also said they had to cancel tours in some cases because they could not book tickets. Travelers now complain on tourism online forums that they cannot obtain the tickets to fly to Nha Trang City to attend the sea festival. 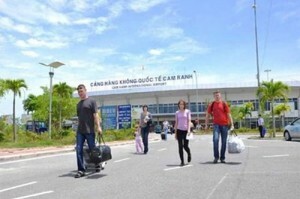 Truong Dang Tuyen, Director of the Khanh Hoa provincial Department of Culture, Sports and Tourism, said in the period from May 2009 to mid 2010, the provincial authorities three times sent dispatches to the Ministry of Transport and relevant ministries, proposing to consider increasing the number of domestic flights. However, nothing has been improved so far. In 2012, Khanh Hoa received 2.3 million travelers, including 530,000 foreign travelers, 90 percent whom came to Khanh Hoa by air. Tuyen believes that the number of travelers could be much higher in the future, if there are more flights from the two biggest cities of Hanoi and HCM City to the locality. The Prime Minister has instructed the Ministry of Transport to consider upgrading the old runways or build a new runway (No 2) at the Cam Ranh Airport. Under the airport development program approved by the Prime Minister, by 2020, the Cam Ranh Airport would be capable to receive ATR72, A320, A321 and B747F. The airport would be enlarged to ensure to have 32 parking lots and receive 27 aircrafts in rush hours. However, a lot of travelers complain about the services provided at the airport. Passengers have to pay VND180,000 for a hamburger with no drink associated, which is believed to be the most expensive in the world. Being an international airport, but there are no seats at the check-in area. The passengers waiting for their flights have to go to the cafés nearby, where they have to pay for their seats and coffee.